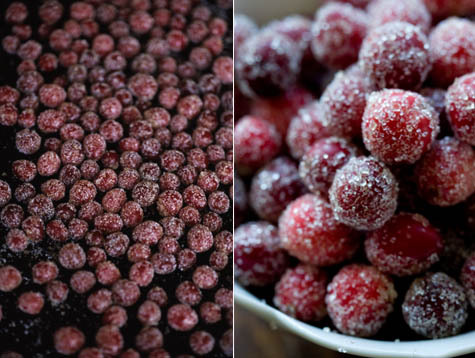 I’ve become convinced that these sparkling, sugared cranberries should be a part of every holiday spread. They glint and wink in the surrounding holiday lights, and lend a striking dash of red to the table. Another great thing is the way they effortlessly make the transition from savory course to sweet. So, for example, I’ve become fond of serving them as part of a cheese spread, but I imagine they’d be nice as the finishing touch on on a tart or clustered atop a crème brûlée or pudding of some sort. This is key, and I’ve experimented with a range of sugars here. Some work better than others. In the beginning, I wanted to make them with a maple sugar coating – but the cranberries looked like they had been dropped in dust. The same goes for raw cane sugar, coconut sugar, and Rapadura. So I gave up trying to do a less refined sugar version. Take note, extra-fine grain sugar didn’t work well either – clumpy. Essentially, the best way to get a good sparkling sugar crust on your cranberries is to first roll them in an slightly-chunky organic sugar (something like this), and later toss them in regular granulated sugar. The small grains of the granulated sugar cling to any spots that are still sticky from the simple syrup.